At Greenwoods your pet's well-being has always been the highest priority. This biodegradable, all-natural, clumping cat litter is made from pure, natural plant fibres from 100% renewable sources. It is compostable, environmentally friendly and has an amazing 700% moisture absorption – that's up to 7 times its own weight in liquid and three times as efficient as traditional cat litter. This litter has a fresh, woody scent, is low in dust and gentle on your cat's paws. Greenwoods Natural Clumping Litter can be put on the compost heap or flushed down the toilet so it is kind to the environment. Life's more pleasant with Greenwoods Natural Clumping litter. Greenwoods Natural Clumping Litter at a glance: 100% completely natural: Greenwoods Natural Clumping Litter is extremely environmentally friendly. It is wood-based and made from 100% natural, renewable plant fibres and is free from chemical additives. Biodegradable: This litter is compostable and can be disposed of in the bin for garden waste or on your compost heap. (Please refer to your local waste disposal regulations for organic, compost and normal household waste.
) Natural wood fragrance: The natural fibres in this litter have a pleasant, woody smell. The litter is free from artificial fragrances, additives and aromas. 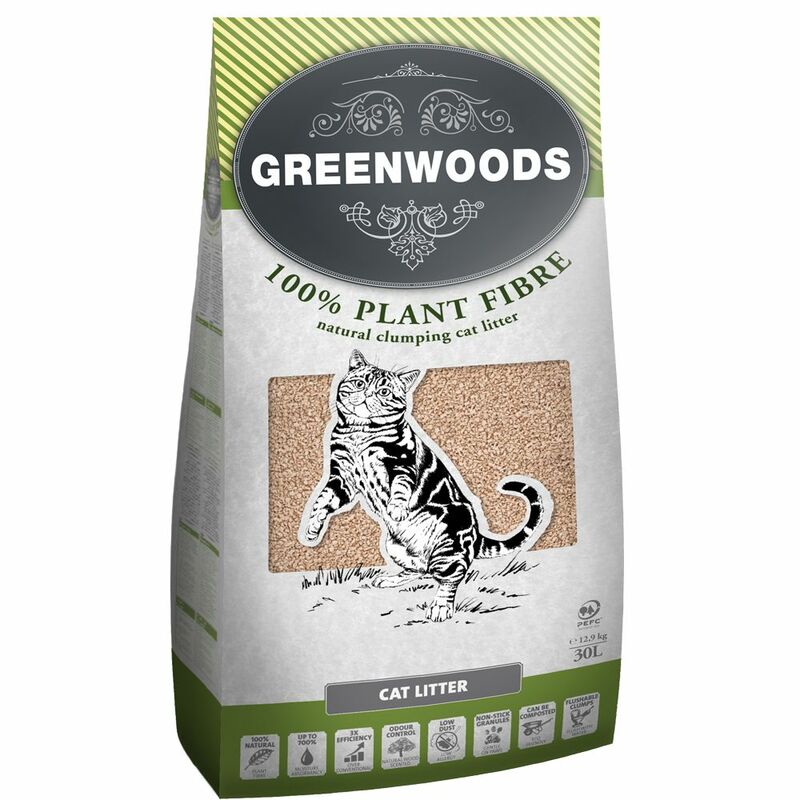 Very economical: Greenwoods Natural Clumping Litter clumps rapidly and can absorb up to 7 times its own volume so it is extremely economical in use. Low in dust: This litter is very low in dust. This is important for older cats and cats with allergies. Very light in weight: This litter is very light and easy to handle and transport Locks in nasty odours and bacteria: Can be flushed down the toilet: This litter is completely natural. Similar to toilet paper, you can dispose of individual clumps in the toilet. (Please refer to local waste regulations.) Gentle to paws: This natural litter does not stick to your cat's paws. Helpful tips: Only flush one litter clump at a time down the toilet. For best results let the individual clumps soften slightly in the toilet before flushing. Make sure each clump has completely disappeared before putting the next clump into the toilet. The clumps are easier to dispose of if they are lightly crushed with the litter scoop before you drop them into the toilet. Never add more than one clump at the same time. Never dispose of the entire cat litter from the tray in the toilet. Please refer to your local regulations for disposal of large amounts of cat litter. For best results remove soiled clumps several times a day and add fresh litter as needed.